Before we get to the review, we would to point our readers in the direction of Kristina Horner’s video review, because in 14 minutes it will perfectly summarise a lot of how we feel about The Heir. On reflection The Selection was a fun series, with an intriguing cast of characters that you only really appreciate the quality of once you have subjected yourself to this spin-off sequel. First of all, Eadlyn didn’t seem to understand her role as a Princess, it’s not just hand massages and baths. Sometimes you have to do things for the benefit of your country! She was an extremely selfish, spoiled and judgemental character. A lot of her opinions on ruling, the staff in her household and even the people in the selection were based on lies she’d told her self. One of the many unsavoury things that Eadlyn did was continue to facilitate the caste system – through catty comments to her maid – even though she was supposed to be the generation that eradicated those boundaries. Her treatment of the contestants was brutal at best and she didn’t seem to have a concept of how her treatment would reflect badly on the monarchy as a whole. In a fragile society, Eadlyn’s insensitive handling of events would surely have sparked more rebellion. Eadlyn used Kile to relieve her tension – apparently she was under a lot of stress, but what queenly duties she attended to I have no idea! – and her general reluctance to see him as a complex human being with actual feelings really highlighted that she isn’t a very nice person. We hope that Kile refuses to continue their relationship in the sequel, because he honestly deserves better. Eadlyn wasn’t taking the selection seriously, and seemed to delight in toying with the contestants emotions, which meant we had no sympathy for her and we think the only acceptable outcome of this series would be for Eadlyn to rule alone. OR, even better, abdicate to her younger brother Kaden, who was the only one who seemed to know what he was doing. It’s pretty obvious that Eadlyn would fall in love with Erik, but her relationship with Henri makes this pretty much impossible to be pursued. We didn’t need to see another selection; we wanted to know more about the outside world. A lot of main characters died or were adversely affected by the rebellion in The One, and yet 18 years later we’ve skipped all the action and things have somehow righted themselves. If it was ambiguous in The Selection series, then any mention of the rebellion was irrelevant in The Heir. We will continue the spin-off duology, albeit reluctantly, because it will be interesting to see if Eadlyn undergoes any character development after she was solely blamed for the protest in her country by her twin brother. Hopefully, Eadlyn will realise her mistakes and start taking her role as a princess seriously, thinking of more people than herself. Overall, we give ‘The Heir’ one star. Although we managed to read it in one day, we did not enjoy a single bit. But, it means that things can only go up from here, right? If anything, this book as made us realise how good first three book in The Selection series are, and think that Eadlyn does not do her mother justice. 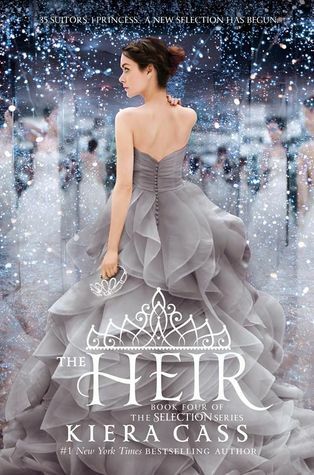 too bad you guys didn’t love it because i’m totally head over heels for the heir.